After completing my 3 day juice cleanse I was on the lookout for some snacks that were in line with a detox, that is, no wheat, dairy or refined sugar. What I found online was a veritable treasure trove of vegan treats. 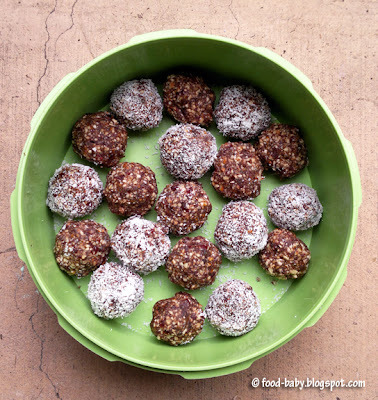 Call them truffles, bliss bombs or whatever you like, they taste amazing and are a brilliant portable snack. This is my version simply based on what I happened to have in the pantry, but the possibilities are endless! Place the almonds in the bowl of your food processor and blitz until they form chunky crumbs. Add the cranberries, cocoa and rice malt syrup and process until you get a sticky and cohesive mix. You can made the mixture as smooth as you like but I prefer to see the ingredients in the finished product so didn't over-process them. Roll into balls, using coconut if you wish. Stored in an airtight container in the fridge they will keep for up to 2 weeks. Absolutely delicious! I'm already planning on making these, as well as a few other variations, at Christmas time. They make a great alternative to sugar and saturated fat filled chocolate truffles. Both the boys loved them too which makes for a happy mummy! These are a great snack, I make similar ones and the kids love them. ok, this is going on my list! genius!